A film of intense perversity—the madness of the mind . . . The narrative style employed by Palm d'Or-nominated director Jerzy Skolimowski (Deep End), lends depth and dimension to a film that is deeply engaging as well as terrifying, winning him the Jury's prize at Cannes in 1978. This film has been justly compared to Nicolas Roeg's '70s classic Don't Look Now. With an enigmatic opening sequence, fragments and flashbacks, this release will appeal not only to fans of the horror genre, but audiences who enjoy intelligent, unusual mysteries. Dir: Jerzy Skolimowski. 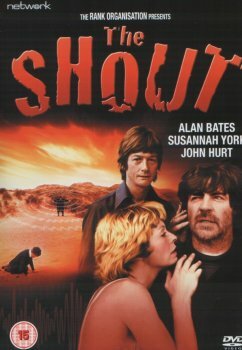 With: Alan Bates, Susannah York, John Hurt, Robert Stephens, Tim Curry, Julian Hough. Rank Film Distributors. Colour. "Most impressive, however, is a commentary from Kim Newman and Stephen Jones. As usual, they are enthusiastic and brimming with knowledge . . . Indeed, in the commentary track on this DVD, Stephen Jones describes The Shout as one of the best British horror films of the 1970s and I can't in all honesty disagree with his verdict." "The commentary recorded recently with critics Kim Newman and Stephen Jones gives some important context to the movie; they speak at length about the short story that inspired the film and mention Graves's possible inspiration for the character of Crossley."